From Herbert 1436: According to Orme (p. 303) and Horne (p. 260) ascribe this original version to David Macrae (or McRae). whose name is also given as J. M. Ray. This writer, who, according to Cotton (p. 110 n.), was born in 1750 and died in 1816 was a licentiate preacher of the Church of Scotland. The preface of the 1815 edition is signed J. M. Ray and is dated London, 1802. Click here for sample verses from this version. 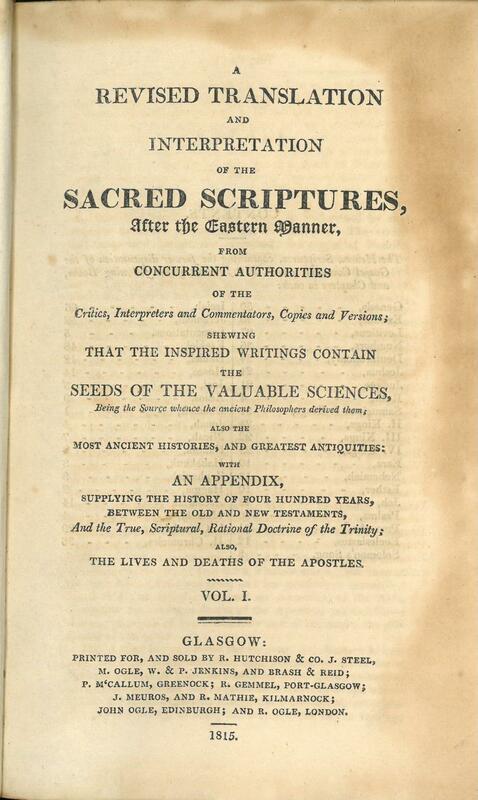 Title: A Revised Translation and Interpretation of the Sacred Scriptures, After the Eastern Manner, from Concurrent Authorities of the Critics, Interpreters and Commentators, Copies and Versions; shewing that the Inspired Writings Contain the Seeds of the Valuable Sciences, Being the Source whence the ancient Philosophers derived them; also the Most Ancient Histories, and Greatest Antiquities: with an Appendix, Supplying the History of Four Hundred Years, Between the Old and New Testaments, And the True, Scriptural, Rational Doctrine of the Trinity: Also the Lives and Deaths of the Apostles. Vol. I. Date: First edition 1799, this edition 1815. Publisher: Glasgow: Printed for, and Sold by R. Hutchinson & Co. J. Steel, M. Ogle, W. & P. Jenkins, and Brash & Reid; P. M'Callum, Greenock; R. Gemmel, Port-Glasgow; J. Meuros, and R. Mathie, Kilmarnock; John Ogle, Edinburgh; and R. Ogle, London. References: Herbert 1607, see 1436, Chamberlin 18-4, Taliaferro-EELBV 7250.120. Comments: The spine of the cited copy reads: "M'RAY'S BIBLE."